The #YoungCitizens’FutureLabs aim at developing innovative ideas for the future of Europe by making use of e-participation tools in order to empower young citizens to set the agenda for the next European elections and to discuss their demands with decision-makers in public #YoungCitizens’Conventions in Berlin and Brussels. The #1stYoungCitizens’FutureLab is organised by the IEP and the EAO with the support of the ASKO Europa-Stiftung and the Europe for Citizens programme and will kick off a long-term consultation process all over Europe. During the kick-off event, young citizens are going to discuss e-participation and digital democracy with Anja Türkan, Digital Strategist, and will develop concrete policy proposals for the upcoming European elections in 2019. 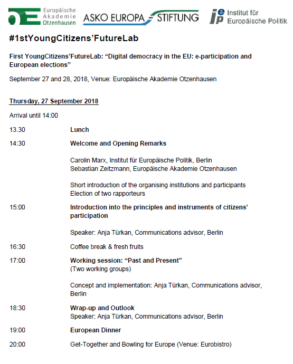 In the run up of these elections, further #YoungCitizensFutureLabs will take place in Nice and Warsaw.